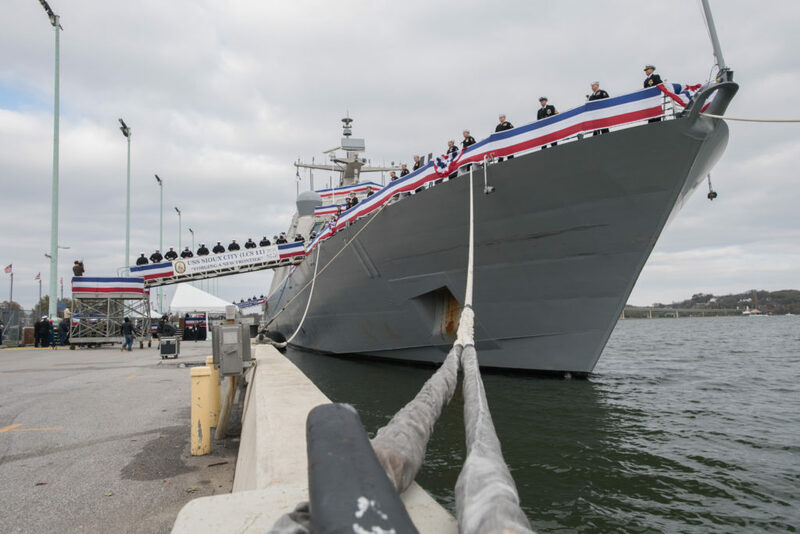 The U.S. Navy commissioned its newest surface combatant, the littoral combat ship USS Sioux City (LCS 11), during a ceremony at the U.S. Naval Academy, Nov. 17. The Freedom-variant littoral combat ship (LCS) is the Navy’s 13th littoral combat ship to enter the fleet and the sixth of the Freedom variant. It is the first ship named after Sioux City, the fourth-largest city in Iowa. The ship’s sponsor, Mary Winnefeld, wife of former vice chairman of the Joint Chiefs of Staff, retired Adm. James “Sandy” Winnefeld, gave the traditional order to “Man this ship and bring her to life,” signaling the Sailors to embark and officially begin service as a U.S. Navy ship. Iowa Senator Joni Ernst delivered the principal address at the ceremony, which was attended by Under Secretary of the Navy Thomas Modly and Chief of Naval Operations (CNO) Adm. John Richardson attended the ceremony. For the ship’s crew, the day was the culmination of a few years of work to get Sioux City prepared for commissioning. It was a special opportunity to bring the ship to life at the Naval Academy, a place where Naval careers – past and future – begin. “This place breeds toughness,” said Richardson, a 1982 graduate of the Naval Academy. Additionally, Richardson noted that the state of Iowa has exhibited toughness as well, increasing its productivity by about 40 percent since 2007. Next, the ship will transit to Jacksonville, Florida to join Littoral Combat Ship Squadron Two and the other LCS vessels that call Naval Station Mayport home. “We’ve made these ships more lethal and survivable, steadily improving them. We’re investing in over the horizon missile capabilities, outfitting them with advanced sensors, placing a combination of manned and unmanned vehicles onboard to support a wide range of missions well into our future,” said Richardson. The LCS is a high speed, agile, shallow draft, mission-focused surface combatant designed for operations in the littoral environment, yet fully capable of open ocean operations. As part of the surface fleet, LCS has the ability to counter and outpace evolving threats independently or within a network of surface combatants. Paired with advanced sonar and mine hunting capabilities, LCS provides a major contribution, as well as a more diverse set of options to commanders, across the spectrum of operations. This entry was posted in Commissionings and tagged commissioning, commissionings. Bookmark the permalink.